The first year of the BME-Paris Master’s (M1) is intended to strengthen and broaden students’ capacities in specific engineering and biomedical subjects. Students have one full year to learn fundamental and practical concepts that are required to obtain an interdisciplinary core before following a specific track of the M2. The courses will then take place on weekly basis. 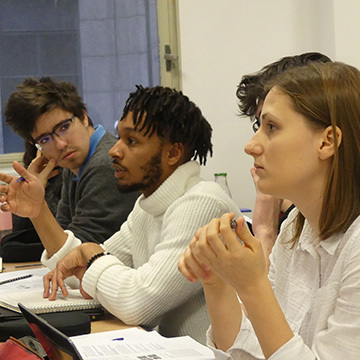 The students undertake a scientific thinking module and courses to the value of 30 ECTS credits (European Credit Transfer Scale). Student choices need to be approved by their academic tutor. Description: This course gives a general view of organs and tissues organization and physiological functions in the human body. It is divided in 2 parts: 1/ lectures on anatomy of human body with special focus on: the cardiovascular system, urogenital system, digestive system and neuroanatomy. The course material is covered in traditional lecture format as well as videos on the 3D anatomy. 2/ lectures on major physiological functions of human body with special focus on bone, cardiovascular and respiratory physiology illustrated with research articles. – to understand fonctional links between organs/tissues sustaining physiological functions. Description: This course is designed for engineers and non-biologists to provide the essentials of cell and molecular biology and to get into more cellular complex networks important in biomedical research. The course material will be covered in traditional lecture format as well as practical sessions illustrating main techniques used in cellular biology research. Based on this course, the student will (i) acquire knowledge allowing to understand functional organization of eukaryotic cells: from macromolecules composing cells to organization and function of cell components ; (ii) be sensitized to “hot topics” of biomedical field such as epigenetics, bioenergetics, or in more integrated systems as the role of microbiota in organ integrity. 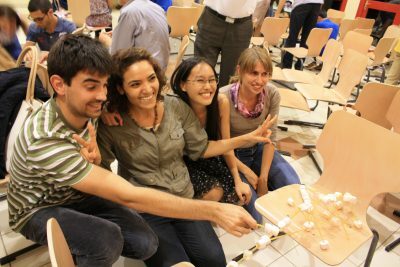 Description: This course is fundamental and interdisciplinary: the aim is for the student to be able to acquire a general vision of the concepts non-covalent interactions in order to understand molecular processes (self-assembly, structures of complex chemical systems, molecular recognition) and to be able to create new assemblies (synthesis, recognition and detection). – Historical background – first examples, emergence of the field: crown ether (Lehn, Pedersen, and Cram). – Definitions: weak interactions, chemistry at the thermodynamic equilibrium. – Towards complex structures: a) different classes (helix, macrocycle, cage, foldamer, grid, etc…). b) topological chemistry (catenanes, rotaxanes, knots, etc…). – Synthetic methods and template effect. – Molecular devices (molecular machines, sensors for anions or cations). This course is proposed by the Master “Frontiers in Chemistry” of Paris Descartes University. Description: This course deals with innovation approaches on nanomedecine in the fields of therapy, diagnosis and theranostic. Nanomedicine is at the forefront of modern healthcare. Nanoparticles offer a new platform for drug delivery that can extend the “patent life” of drugs, but also greatly increase the targeting and effectiveness of therapy. They can enhance most of the medical imaging modalities, and in some cases offer a combined diagnostic and therapy, now called “theranostics”. This course aims to provide students with the necessary training to be able to understand the principles of nanotechnology and its application in medical research and clinical practice. The practical course aims to broaden the knowledge and skills of the students in the areas of nanoparticle synthesis, characterization and processing in biomedical applications. Description: Non-deformable Solid Mechanics describes the motion of macroscopic objects, from projectiles to parts of machinery. If the present state of an object is known, it is possible to predict by the laws of classical mechanics how it will move in the future (determinism) and how it has moved in the past (reversibility). The earliest development of classical mechanics is often referred to as Newtonian mechanics. It consists of the physical concepts employed by and the mathematical methods invented by Isaac Newton and Gottfried Wilhelm Leibniz and others in the 17th century to describe the motion of bodies under the influence of a system of forces. The objective of this course is to train the students of the Life Sciences (Biologists sub-track) to the tools of the mechanics of the non-deformable solids. This course will be based on examples from the biomedical field and more particularly from biomechanical applications: articular biomechanics, muscular force evaluation, … etc. The course is divided into 16 hours of lectures and 16 hours of guided exercises, part of which will be performed on computer (Matlab). 1. Cinematics of point and solid. 2. Mechanical joints & kinematic diagram. 3. Modeling of mechanical actions. 4. Kinetics and Dynamics of solids. 5. Fundamental Principles of mechanics. Prerequisites/skills needed: Basic notions of mathematics: Linear algebra (vector and matrices), Multivariate functions (derivatives and integrals), Vector and affine mathematical spaces. Description: Students will learn the basics of the spin physics that is underlying magnetic resonance, and discover the most recent spectroscopic and imaging applications based on this phenomenon. Introduction to Magnetic Resonance: physical basis, principle of pulsed NMR spectroscopy, principle of MRI. Metabolomics: Introduction to « omics » sciences, and the contribution of metabolomics. Analytical techniques in metabolomics: Nuclear Magnetic Resonance and Mass Spectrometry, experiments, comparison of strengths and weaknesses. Basics of statistical analysis for metabolomics. Examples. Magnetic Resonance Imaging: physical basis, gradient spatial encoding, concept of k space, contrast, spatial / spectral resolution issues. Introduction of contrast agents, comparison to other imaging techniques. Examples. NMR in Biomedical Research and Development: Structural and dynamics analyses in biology, drug design (« SAR by NMR »). Students will acquire basics of quantum mechanics for the description of the spin dynamics occurring during magnetic resonance experiments. They will be able to identify the potential of magnetic resonance techniques for providing an insight into a variety of systems in chemical, biological or medical studies, and to select the most adapted MR-based tools to address specific issues. Description: This course covers the physical principles of major bio-imaging modalities: from optical microscopy to ultrasound, positron emission tomography and magnetic resonance imaging. We will show how existing physical principles transcend into bio-imaging and establish an important link into life sciences, illustrating the contributions physics can make to life sciences. For each specific imaging instrumentation, biomedical applications will be shown to illustrate the respective imaging modality, its use, advantages and limitations. It is a project-based learning course where students work in groups on a specific imaging instrumentation. Based on this course, the student will be able to judge which imaging modality is adequate for specific life science needs and to understand the limits and advantages of each technique. Teaching methods and activities: lectures (CM), other: project-based learning, inverted classroom. Description: The course is an introduction or a review of some fundamental topics in mathematics that are used in most domains where models have to be achieved. The main tool introduced is matrix and secondary tool deals with multivariate functions. The course material will be covered in traditional lecture format as well as practical sessions. In the end, students will have to compare their analytical results with those obtained with the aid of a mathematical software (Matlab). • Be familiar with operations and characteristics computed from matrices. • Be able to introduce matrices to solve some problems. • Understand how a matrix can model a linear transform. • Understand how a matrix can model a quadratic form and define some distance notions. • Be able to study the extreme points of multivariate functions. • Be able to solve optimization problems under equality constraints. • Be familiar with the least square method. Description: This course will develop intermediate level mathematics with an emphasis on their utility for modeling in biology, physics or imaging. The course will have four main parts: 1/ Differential equations (systems, existence and unicity, maximal and global solutions, stability, numerical integrators: Euler, Runge-Kutta), 2/ Optimization (unconstrained and constrained, convexity, projection, algorithms: gradient and projected gradient descents), 3/ Probability (limit theorems, Markov chains, stochastic algorithms), 4/ Fourier Transforms (continuous and discrete, series, convolution, Fast Fourier Transforms). Sessions will alternate between standard lectures, analytical exercises and programming sessions (with Matlab and XPPAUT) to illustrate the topics and develop the practice of programming. Description: The objective of this course is to give the student who has no skill in computer programming, the basic principles of object oriented programming. The studied object oriented languages will be Python and JAVA. As Python is an interpreted language and has basic syntax that is common to JAVA, it will help the student in their learning process in how to design simple programs (operators, flow control statements, functions). Then the focus will be put with the use of JAVA on the design of classes, the instanciation and the manipulation of objects. Finally, the relations between the objects (aggregation, inheritance) will be addressed. Description: This course is an introduction to Biomedical Modeling, using Matlab software. With biomechanics and biomedical relevant examples, students will see: 1) How this tool can be used as an objective mean for automated data analysis, 2) How current biomedical knowledge can be implemented into models and simulations, 3) How it helps designing and analyzing new experiments. This course consists of lectures (Matlab basics 10h), 3 short project sessions (3x4h) and a final project. Description: This course aims at giving the sound bases for modeling biological systems. The emphasis will be put on modeling in neuroscience at different scales, from the molecular level to the collective dynamics of neuronal populations in the brain, but the concepts and methods taught in the course have a much broader relevance in biology. The interdisciplinary approach used in this course will rely on basic notions of biology, physics, chemistry, mathematics and computer programming. Lectures will be intertwined with practical sessions of modeling, analytical studies and numerical simulations that will heavily relied on the easy to use freeware XPPAUT. Students will learn: 1) the basic operating principles of neurons (and cells), 2) their biophysical and biochemical underpinning (receptors, signaling pathways), 3) how to model them with systems of ordinary differential equations, 4) how to analyze these mathematical models, 5) and how to simulate them numerically. This course will be particularly useful for students with a particular interest in neuroscience, while give a solid background in biology to all. It will constitute an introduction to dynamical systems theory (attractors, bifurcations), which is used in numerous scientific fields, and will demonstrate the usefulness of mathematical and physical concepts for understanding the operation of biological systems. Prerequisites/skills needed: Basic notions of mathematics: matrices and linear differential equations. Basic notion of chemistry: reaction rates and kinetic equations. Familiarity with a programming language. Description: This course will cover several aspects of molecular, cellular and tissue biology focusing on the key actors of cellular /tissue homeostasis and their deregulation at the root of pathologies. This course will provide a framework for students with basic (Bachelor) level in biochemistry and cell biology to acquire a comprehensive knowledge on topics in close contact with active research. and 4 training session on article analysis. – to train the abilities to collect, understand, summarize and present published data via article analyses. – to become familiar with modern molecular and cellular biology techniques. – Preparation and participation to scientific conferences in a subject closed to Biomedical engineering field. The preparation of conferences is conducted by groups of 2 to 4 students that have to present (i) a bibliography of a speaker, and (ii) a scientific topic corresponding to one conference session. During the conference, student pairs play the role of chairman and have to (i) introduce the speaker; (ii) ask questions after the talk and (iii) make an interview of the speaker. – Analysis of scientific articles on Biomedical or Engineer topics. This part includes (i) the presentation of a topic by a researcher introducing articles to be analyzed, (ii) analysis and oral presentation of articles by pairs of students. Description: The goal of this course is to enhance students’ communication skills and give practical methods to effectively present and discuss scientific results. The course is designed to provide students with a range of resources and skills to write a thesis, prepare a presentation and develop constructive critical scientific thinking. Topics covered in this course include: – searching the scientific literature, – structure of a scientific paper, – references management and ethics in writing, – writing a literature review, – writing an internship report, – creating an effective presentation, – delivering an attractive talk, – designing a poster, The course consists of lectures, discussions, group work and practical exercises. Description: This lecture is an introduction to Solids Mechanics. In this course, we will study the relationships between the external loads applied to a deformable body and the intensity of internal forces denoted stresses acting within the body. Illustrated on linear elastic material, we will define the relationship between stress and strain (constitutive relation) in order to provide tools allowing the sizing of structures. We will propose a systematic approach to solve these analytic problems and we will generalize these formulations using energetic theorems that will become the basis of the finite-elements theory. Description: This personal student work consists in writing a review paper on a subject matter central to your internship or project. By organizing, integrating and summarizing previously published data, this work will benefit to improve your scientific communication and will give you a solid understanding of how your research project fits in to what the scientific community has already done. Description: The aim of these interdisciplinary projects is to promote active learning by real case studies to face. We will challenge a group of 4 students with a real scientific question and they will have to explore and find a solution by designing and developing their own experiment and collect data. Finally, they will have to propose a model which behavior matches the data they recorded. These collaborative projects will be carried out throughout the second semester of the M1 to allow students to apply theoretical knowledge and skills learned during the first semester. Students will be leaded by a researcher and they will have access to a BioTech FabLab to build, engineer, design and make a prototype for their projects. If they need they will have also access to the technological platforms (FACS, imaging, biochemistry…) of the Biomedical department but also to labs. These projects will consolidate their understanding of an interdisciplinary subject and develop transversal skills such as team spirit, leadership and also the capacity to take initiative, to test, to overcome problems and to innovate. Please note that you must have successfully completed the M1 year (60 ECTS) at Paris Descartes in order to progress to M2. 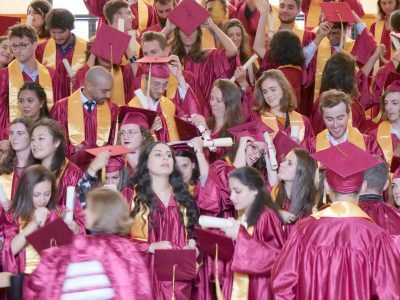 You will be enrolled as a Paris Descartes student for the two years.